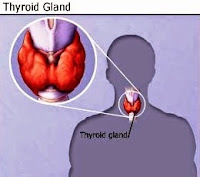 Home Health Notes Thyroid Problems What Are Thyroid Problems? Through the hormones it produces, the thyroid gland influences almost all of the metabolic processes in your body. Thyroid disorders can range from a small, harmless goiter (enlarged gland) that needs no treatment to life-threatening cancer. The most common thyroid problems involve abnormal production of thyroid hormones. Too much thyroid hormone results in a condition known as hyperthyroidism. Insufficient hormone production leads to hypothyroidism. • Graves' disease: The production of too much thyroid hormone. • Toxic adenomas: Nodules develop in the thyroid gland and begin to secrete thyroid hormones, upsetting the body's chemical balance; some goiters may contain several of these nodules. • Subacute thyroiditis: Inflammation of the thyroid that causes the gland to "leak" excess hormones, resulting in temporary hyperthyroidism that generally lasts a few weeks but may persist for months. • Hashimoto's thyroiditis: In this autoimmune disorder, the body attacks thyroid tissue. The tissue eventually dies and stops producing hormones. • Lithium: This drug has also been implicated as a cause of hypothyroidism.